One of the biggest challenges when investing through social lending platforms such as Lending Club is evaluating loans to minimize, but not totally avoid, risks involved in lending money to total strangers. It’s not an easy task because, though Lending Club does its job to collect and verify the data, there’s just some much information you can access in the borrower’s profile. When I choose loans to fund, much of my research focuses on each individual borrower’s qualifications, such as credit, income, job and debt, etc., because these data in critical in selecting the right borrowers. In my previous post, I outlined steps I take when I evaluate Lending Club loans. That’s the procedure I usually take when deciding which loan to fund and which to stay away. However, for those who are still considering whether peer-to-peer lending, such as Lending Club or Prosper, can be used as an alternative investment vehicle or not, the main concern is probably the collective performance of Lending Club: The total amount of loans funded, average interest rate, overall delinquency rate, and average borrower credit score, etc. For to-be lenders, a single borrower and loan request have much less meaning than the overall statistics of the all Lending Club borrowers. 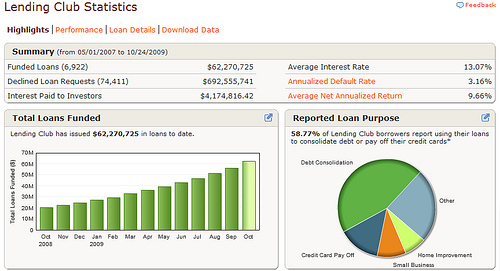 The average annualized default rate of all LC loans is 3.16% since inception. And a lot more information including comparison of returns between Lending Club and stock markets and breakdowns of each loan category (LC has a total of seven loan categories, from A to G, where A is the highest loan grade, depending on the borrower’s credit worthiness). If you want to dig deeper into the data before making a decision, you can even download all the data in to Excel and do you own analysis. What I do like about Lending Club is that they are very open and transparent. I’ve talked to their customer service folks and they are nice to the n degree. Can’t say the same about any other financial institution.